Companies in the pre-owned car market are witnessing growth like never before, courtesy the growing aspirations of consumers, manufacturer-backed offers and exponential growth in the e-commerce space. Till a few years back, the ratio of new to used cars was 1:1.2. This has now grown to be 1:2.2, according to the reports of CRISIL. This implies that for every 10 new cars sold, 22 used cars are finding buyers. It is interesting to note that with a steady decline in the holding period of a vehicle from six years to three years, there has been a significant increase in the supply of used cars. Market watchers have also asserted that the new passenger vehicle market is set to close at 2.8 million units this year. 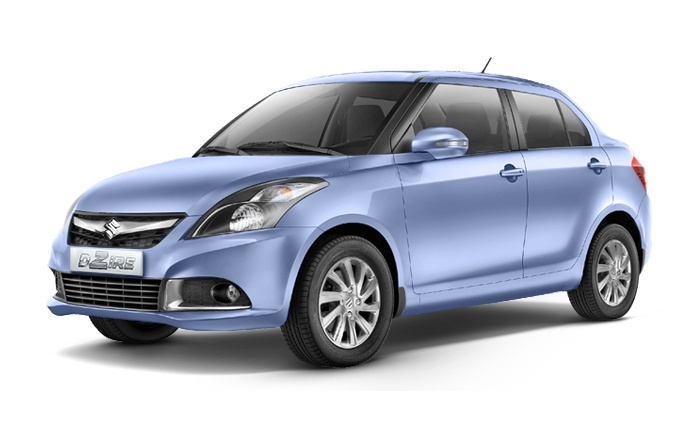 Ever since its launch in 2012, Maruti Suzuki Swift Dzire has been the country’s top-selling sedan. It comes with its own set of perks and benefits. You can bid adieu to the clutch, as the Dzire is the first Maruti Suzuki Diesel variant with the AGS technology. So, you don’t need to fret about any clutch pedal, and what’s more, you are ensured uncompromised mileage and the best of technology. When it comes to the interiors, this car boasts desirability with its luxury seating, attractive upholstery, and swanky interiors. Result: you feel absolutely at home even when you’re driving! > With a fuel efficiency of 26.59 kmpl, the new DZire is being projected as India’s most fuel efficient car. The 84.3 PS/115Nm 1.2 litre K-series VVT petrol engine gets a higher compression ratio and a compact combustion chamber to increase the fuel efficiency to 20.85 kmpl, which is considerably higher than the earlier 17.94 kmpl. Further, the 1.3l 75 PS/190 Nm diesel motor has an advanced thermal management system along with engine oil optimized to ensure low friction and modified fuel injection system. This is how the Swift DZire diesel achieves a claimed mileage of 26.59 kmpl. > When it comes to safety features, the Dzire VDi, ZDi, and ZXi now come with ABS and EBD while the ZXi and ZDi are equipped with dual front airbags. > With the exterior styling, however, Maruti has decided to play it safe. The front bumper of this updated compact sedan is all-new, and now comes with a larger air dam. The chrome accents on the sides, coupled with the fog lamp housings add on its appeal, while the grille too now flaunts honeycomb styling and a thick chrome bar on the top. Coming to the sides, the alloy wheels on the top variants have got an all-new design, while the lower variants get restyled wheel caps. New paint shades have also been added to the updated Swift Dzire’s line up. > Moreover, the new Lxi (O) variant, besides all the equipments on offer in the base Lxi trim, additionally gets front power windows and remote locking. The top-spec trims of the updated Dzire will let you enjoy additional features such as remote locking with push-button start, Bluetooth for the audio player and rear parking sensors. The top trims come with automatic climate control. There is also a 12Vaccessory socket for the rear passenger. Over the past two generations, the Maruti Suzuki Swift has earned a more premium status and has increased its focus on young enthusiasts as its core target group. It also enjoys significant popularity amongst pre-owned cars in Hyderabad. > As far as engines are concerned, the 2018 Swift continues to be powered by the same 1.2 litre petrol and 1.3 litre diesel engines of the previous generation. The petrol motor churns out 83PS/113Nm while the diesel variant develops 75PS/190Nm. Unlike its predecessor, the new Swift is accompanied by a 5-speed AMT (automated manual transmission) with both the engines besides the 5-speed manual gearbox. However, it is interesting to note that the automatic is offered only with the V and Z variants in the initial stage. > Though the new Swift shares its engine and lighter structure with the outgoing model, it claims to offer a mileage of 22kmpl and 28.4kmpl from the petrol and diesel motors respectively. 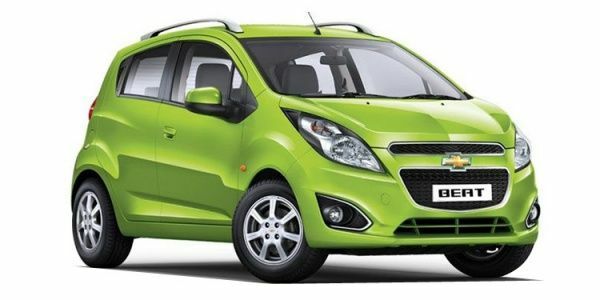 > When it comes to the design, the new Swift borrows the sporty look of the decade-old Swift and gives it a revamped avatar. Besides the more ‘mature’ looking front fascia, it also flaunts a redesigned headlamp unit which sports projector headlamps and LED daytime running lamps as opposed to the multi-reflector units in the previous version. The turn indicators in the headlamp unit are pushed towards the grille in the new Swift. Additionally, the chrome garnishing has been given a miss, though the circular fog lamp housing has been retained. Also, the new Swift comes with a large hexagonal grille with vertical slats in place of the honeycomb mesh seen in its predecessor. > The new Swift is 40mm wider and has a 20mm longer wheelbase, which leads to improved cabin space. The ground clearance has been reduced by 7mm, while the boot space has been slightly increased to 268 litres. > If you opt for this car amongst second hand cars in Hyderabad, you can also expect increased shoulder and knee-room for rear passengers. The cabin gets a more premium feel, thanks to the new dual-tone dashboard layout. Aircon vents in the centre are now round in shape and the AC controls to get new rotary dials. The no-nonsense instrument cluster has been replaced by racing-car inspired dials. There is Android Auto and Apple CarPlay for this unit which is only available for the top-end ZDi+ and ZXi+ trims. > There are a neat climate control system and a three-dial design with the central screen showing the temperature. The flat bottomed steering wheel feels nice to hold and the plastic quality is much improved over the previous Swift. There is a reddish-orange hue for the dials which is very sporty. There is good knee room and headroom along with decent legroom. However, there is no rear AC vent and under thigh support could have been better. > The 2018 Swift gets ABS and dual airbags as standard features along with rear Isofix child seat restraints. The music system is decent for lower variants although climate control is not available for the LXi and VXi variants. Additionally, the AMT option should have been offered for the ZXi+ and ZDi+ trims since several buyers would have liked to get the touch screen infotainment system and the daytime running lights which are available for only these top-end petrol and diesel trims. > Like the Dzire, the Swift is equipped with a flat-bottom leather-wrapped steering wheel, auto climate control, and passive keyless entry system with push-button engine start-stop. It also promises Suzuki’s 7-inch SmartPlay infotainment system which supports both Apple CarPlay and Google Android Auto along with MirrorLink connectivity. Besides, you can expect built-in navigation with Aux-in, USB and Bluetooth connectivity. > It hardly needs to be mentioned that Maruti is known for offering to standardizing essential safety features in its recent cars, so it is hardly surprising that the new Swift boasts of dual front airbags, ABS with EBD and brake assist, front seat-belts with pre-tensioners and force limiter, Isofix with child seat anchorages, seatbelt reminder and engine immobilizer. 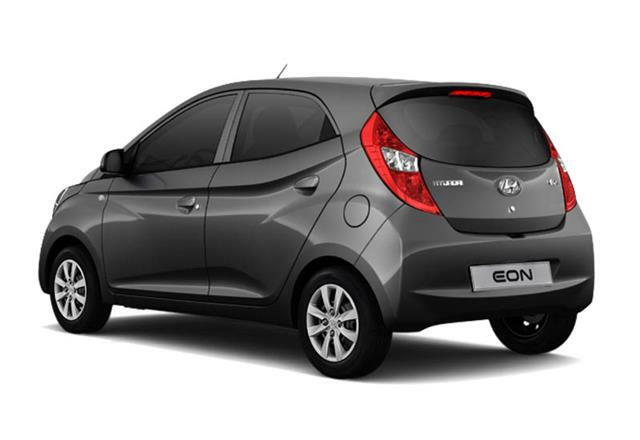 Having forayed into the Indian market in 2011, the Hyundai Eon is the automaker’s mini-hatchback intended to challenge Maruti’s ace model in the segment, Alto. Its fluidic design philosophy was quick to catch the fancy of car-lovers. Available in petrol and LPG fuel options, this offering derives power from a 800cc unit and a 998cc engine. However, it misses out on the AMT unit making do with a five-speed manual transmission. 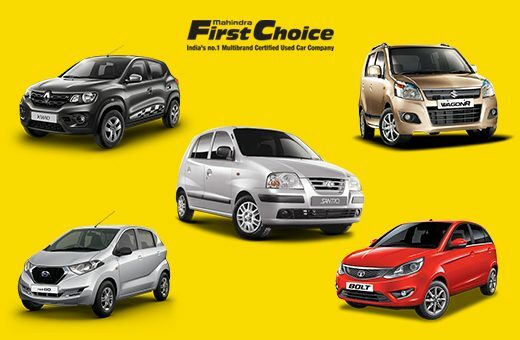 Nevertheless, this features as one of the top choices for buyers of used cars under 3 lakhs in Hyderabad. > In terms of engine, there are two options to choose from- the 814cc, three cylinder unit churning out 56PS at 5500rpm and 7.6kgm torque at 4000rpm. Other is the 998cc, three pot engine that produces 69PS at 6200rpm and 9.6kgm at 3500rpm. Both the engines are mated to a 5-speed manual transmission. > The claimed mileage figures for the 1.0 litre Kappa VTVT petrol engine and the 800cc engine are 20.3kmpl and 21.1kmpl, respectively. > Compared to the body, the tyres are small. This range also gives a miss to alloy wheels, and sports full wheel covers. It comes with disc brakes in front axle and drum brakes at rear axle. > The hatchback is equipped with safety features like central locking, keyless entry, front fog lamps, engine immobilizer, seat belts in the front and rear and inside rearview mirror. Driver airbag, on the other hand, is optional from D Lite+ onwards and is a standard provision on the top end variant, though the entry level trim gives it a miss. >This car challenges the widely held notion that budget cars have mediocre looks and drab styling elements. In terms of exterior, buyers will be impressed by the pulled back headlamps which flank the sleek chrome grille, the triangular fog lamps and multiple slat air-intakes on the bumper, side panel featuring sharp beltline, ORVM on the passenger side, flared wheel arches and supporting character lines at the bottom. The rear facade to flaunts stylish elements such as the moon shaped tail lamps, prominent spoiler on top and a large body coloured bumper. > The cabin is slightly upmarket, as compared to its rivals, thanks to the dual tone dashboard and centre console featuring silver bits. The occupants can enjoy ample legroom, headroom, and shoulder room, and there is also generous space for storage. Besides, the boot offers sufficient space even with the LPG kit. > Other features in the interior include instrument panel with gear shift indicator, exclusive dashboard storage, AC vents, floor console storage, front power windows, front arm-rest, Eon-power outlet, electric power steering, cup holders, map pockets with bottle holders on the front door and rear parcel tray, etc. Besides, it also promises a 2 DIN audio system with AUX-in and USB ports, though other features like Bluetooth and mounted controls are missing on the line-up. Produced by the South Korean manufacturer Hyundai between the year 2002 and 2011, this car comes with an extra smooth 12V, 4 cylinder in-line engine. Equipped with SOHC engine, it also gets a special MPFI system. Thanks to the outstanding engine, this car can deliver a power of 82.9PS at the rate of 5500rpm. The maximum torque produced by this car is early 11.8kgm and at the rate of 3200rpm. The car comes with a standard five speed automatic transmission which allows very easy shift between the gears. The prime features that make this hatchback a popular choice for buyers of this segment include, funky styling, great fuel efficiency, and top-notch quality. The car features a total of 4 trims- PS, LS, LT, and LT Option Pack. The four trims are available with both diesel as well as petrol engines while the LPG kit can be availed with the mid and top variant only. > The petrol versions are powered by a 1.2 litre engine that displaces 1977cc along with a power output of 80.5PS at 6200RPM against a peak torque of 108Nm at 4400RPM. What’s more, the DOHC (Double Over Head Camshaft) along with the engine aids in minimizing friction, less polluting emission, and enhanced performance. > The balanced power-weight ratio of the car coupled with the light clutch ensures stable and smooth drivability on the roads. > The 1.2 litre 4-cylinder petrol engine promises an ARAI rated mileage of 18kmpl. The 1.0litre SMARTECH common rail diesel engine is a market-leader in terms of fuel efficiency, which stands at 25kmpl. With LPG kit, you can get a mileage of 13km/kg. > As far as urban driving is concerned, this car is a safe option, thanks to its robust build, high ground clearance, and effective weight: power ratio. > In terms of exterior appearance, buyers can expect a sporty look which is enhanced by sleep body graphics and sturdy build. The front fascia shows off a dual split grille which is crowned by a golden bowtie, the large leaf-style halogen headlights, body coloured bumpers, and a pair of fog lights. > The hatchback also features tubeless tyres, rear spoilers, ideally positioned rear door handles, and body toned bumpers. However, it’s only in the top end variants that you will get chromed front grille, ORVM on both sides, body tones door handles, silver satin roof rails, and B pillar stylish strips. The side profile stands apart with its sculpted wheel arches, sporty roof rail, attractive crease lines, and a pair of 5 spoke alloy wheels. The overall impressive look is complemented by the LED tail lights, high mounted stop lamp, rear wiper, and body toned bumper. > Coming to the interior, the uber cool dashboard with unique super bike style meters will attract your attention instantly. Other impressive features of the cabin include, a tilt adjustable three-spoke power steering, ample legroom, headroom, and shoulder room, storage cubicles, bottle holders, climate control, rear wiper with washer, an integrated stereo with 4 speakers, central locking, power windows, etc. > Common safety features that all versions are endowed with include, height adjustable front seat headrests, driver seatbelt reminder, and high mounted stop lamp. The mid variant gets day and night rear view mirror and central locking too. The top end additionally comes with front fog lamps, ABS, dual SRS airbags, and front seatbelts with load limiter.